Welcome to my Double i, LLC website! 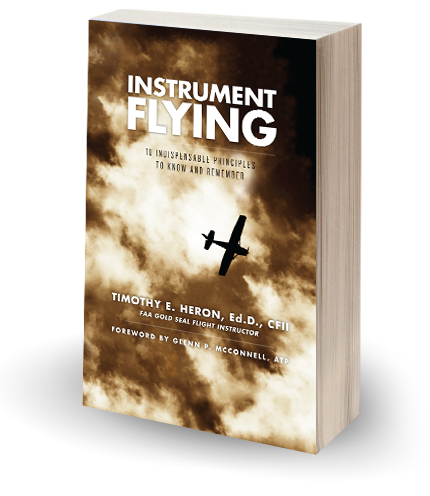 I trust that you will find that my book on instrument flying, and the associated tips, procedures, and links found on this website, will set the occasion for you to improve your instrument flying skills. Let’s face it. Not one of us, as a general aviation pilot, is as well-trained in instrument flight as we could—or probably should—be. Hence, my goal in writing this book was to provide ten indispensable principles for instrument and IFR flying. Supported by the input of a cadre of distinguished instrument instructors and pilots, I have outlined these principles—and techniques to remember them—because I believe they are critical to ensuring your instrument flights are positive and safe experiences for you and your passengers. Further, I believe you will improve as an instrument pilot if you use these guiding principles as the foundation for your flights. No doubt you’ve heard the expression, “A good pilot is always learning.” So, whether you are an emerging instrument pilot, a relatively new instrument aviator, or a veteran instrument flyer, I believe my book will serve as a viable supplement to the technical training that you may be receiving, or have received, during your flight, simulator, and ground lessons. It is my goal that my book will bring ten key principles of instrument flight into sharper focus and provide you with functional methods to use them. I would add that good instrument pilots are always challenging themselves, as well—striving to improve their conceptual knowledge and practical skills. Further, they are vigilant about factors that affect their ability to operate safely on instruments, and they have the discipline to pull the plug on flights that exceed their own established minimums. By reading my book in the context of your own instrument flying experiences, I further trust that you might recalibrate your thinking on significant elements that make for successful, well-managed, efficient, and safe flights. On a personal note, I have been fortunate to fly with, and to have been in the company of, scores of well-trained and highly disciplined instrument pilots and instructors who abide by the principles outlined in my book. Flying on instruments with them, or even just talking to them about instrument flight within the context of these principles, changed my perspective in a fundamental way. I wish you the same good fortune in your interactions with your friends, colleagues, and instructors.